Reading each pair of numbers as a 2 digit number, they follow the sequence of square numbers from 6 to 9. 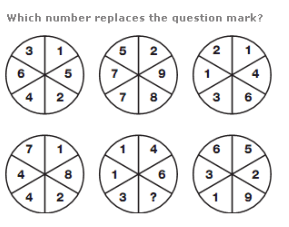 Taking the top row of circles, numbers in the central circle equal the sum of the numbers in corresponding segments of the left and right hand circles. 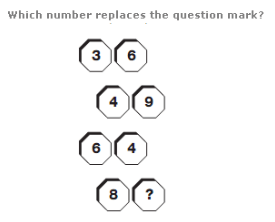 In the bottom row, numbers in the central circle equal the difference between numbers in corresponding segments of the left and right hand circles. Starting at the top left, and moving through the diagram in a Z shape, double each number and add 3 to give the next number along. 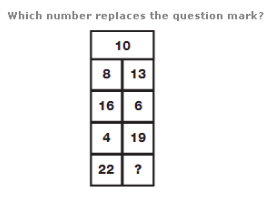 Moving to the right, double each number and subtract 3 to give the next number along. 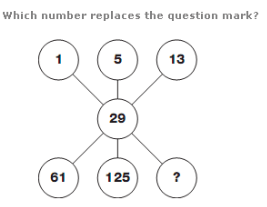 Starting with the 10 at the top, one set of numbers increases by 3 each time, written in alternate boxes as you move down the diagram, and the other set of numbers decreases by 2, written in the boxes remaining.